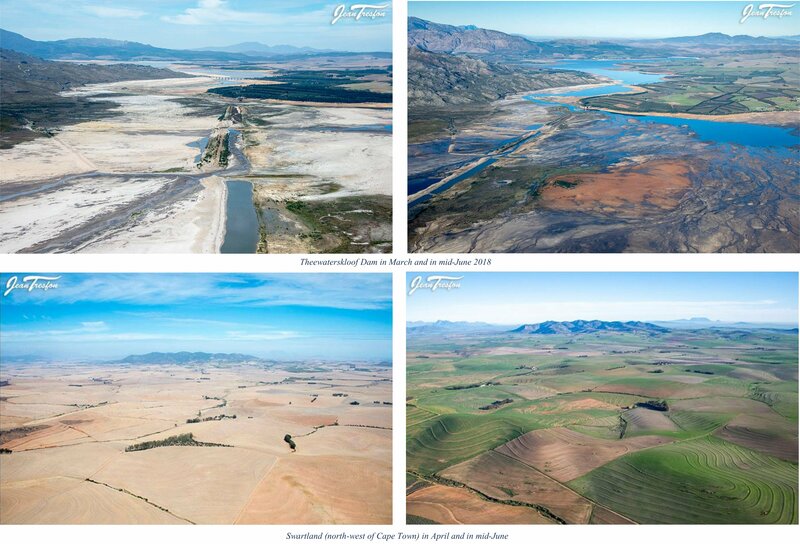 I wanted to provide you with an update of the water situation in Cape Town and our surrounds. Good early rains have seen an encouraging rise in the region’s dam levels. Winter in the Western Cape has gotten off to a good start insofar rainfall is concerned. May and June to-date has seen good rains in the city and, more importantly, in the catchment areas. Cape Town dams are currently 38% full against 23% this time last year. The Western Cape’s dam levels are sitting at 31,5% compared with 21% in June 2017. Rainfall, as can be expected, varies significantly from one area to another. Cape Town’s Newlands suburb, at the foot of Table Mountain, is known to be the wettest in the city, and has this winter received almost 30 inches, whereas the Theewaterskloof Dam, the city’s biggest supply dam, has received 6,5 inches. Perhaps the most impressive aspect of the drought is the way locals have rallied together to reduce water consumption. A year ago, Cape Town’s daily consumption was in excess of 1 billion litres (264 million gallons) per day. The daily average now is around 500 million litres. Cape Town also has several temporary desalination plants that have started to contribute to the city’s water supplies. It is anticipated, over the next two years, that these plants will contribute about 16 million litres per day. Another considerable source of water is groundwater. The city has identified three sources, including the Table Mountain aquifer, that could augment the city’s water supply by up 150 million litre per day. Some of these are already operational whilst testing is being conducted on other sites. Meteorologists predict a 50-60% chance of an “above average” winter rainfall in the Western Cape and we are holding thumbs that this will be the case. Cape Town is fast becoming regarded as THE most water-wise city in the world and this is something, that we as Capetonians, are very proud of. I hope the weather, wherever you are, is also treating you kindly …! We are delighted to announce that Michelle Meyer is back at Trans Africa Safaris. Michelle worked at TAS from 2004 until 2016. She then took a breather to work elsewhere in the industry, but we have been able to ‘lure’ her back and are very excited to have her back in the our family! I’m sure the many agents who have fond memories of working with Michelle, will join us in welcoming her back to Trans Africa Safaris. We recently hosted a fantastic group of agents on an educational trip of Cape Town, the Winelands, Victoria Falls and Botswana. The group comprised mostly American agents, with one Canadian and one American-Australian. We were graciously hosted by One&Only Cape Town, Belmond Mount Nelson, Royal Livingstone, Great Plains’ Duba Expeditions and Belmond Eagle Island – wonderful partners, each and every one of them! A great time was had by all with many exceptional experiences – lovely wines and cuisine in Franschhoek, shopping in Cape Town, a delightful Zambezi River cruise, a lion hunt, boating & canoeing in the Okavango Delta, a helicopter flight, a bush dinner and a milestone birthday on safari to boot!! We have no doubt that our group of ladies all returned home with a stockpile of life-time memories and we look forward to showing many more our agents and their clients our magnificent destination. As has often been said before, “You may leave Africa, but Africa never leaves you ….”! If you would like to be considered for future educational trips, please do let us know. Last month we launched our new company brochure. Our 2015-17 brochure, we believe, is a high quality book that is both visually appealing, informative and inspirational. We are proud to offer this brochure to you and your clients. We are in the process of mailing to our agent database, but should you not have received the book, or require additional copies, please do let me know. In January 2013 , Marine Dynamics, Trans Africa Safaris’ preferred White Shark Cage operator in Gansbaai (near Hermanus) notified the Dyer Island Conservation Trust of a juvenile (3 metre) female Great White Shark entangled in fishing line. The line was wrapped tightly around the head through the gills and was trailing half a metre of line behind the shark which still had bait and hooks attached. The situation was severe and if the line remained, the shark faced a certain death. Even though white sharks are a protected species in South Africa, they are still targeted by shore-based fishermen. Within 48 hours, Oceans and Coasts had deployed a team of researchers, deck hands, and Two Oceans Aquarium specialist fishermen to Gansbaai. Yet, the entangled shark evaded the multi-day search and bad weather forced the crew back to land. Since most white sharks only spend a few weeks at a time in Gansbaai, fears began to grow that the shark would leave the bay before the team had a chance to disentangle the it. It was clear that if the shark did re-appear, that would be the last chance to set the it free. The Cape Chamber of Commerce together with ABSA Capital recently staged the Western Cape Exporter of the Year Awards 2012 and Trans Africa Safaris is proud and honoured to have been named as one of the ten finalists. This achievement is all the more impressive given the somewhat challenging trading conditions in the tourism industry during 2011 and early 2012. The Exporter of the Year competition, now in its 21st year, allows the Chamber to honour exceptional achievers for their contribution to the economy and promote business generally. Judging criteria include; notable achievements in the export of products or services, product improvement, positive contributions made to local communities and the creation of employment & empowerment opportunities. The Chamber firmly believes that growing the local economy lies in innovation, increasing the skills base and expanded diversification. Recently Lesley and André participated in the 2-day Houw Hoek Mountain Bike Race in the mountains surrounding Cape Town. The recreational ride allows riders to have fun on the bike, enjoy the stunning views along the route and have good time with friends. The ride starts at the charming Houw Hoek Inn and winds its way through picturesque farmlands and wineries of the Elgin Valley to the Hermanus pietersfontein Winery, in Hermanus. A total of 115 km. The pictures below will give you an idea of what the terrain is like. In November, we had the Renshaw Travel Canadian Garden Group visit South Africa. During their time in Cape Town, they worked with a project called Lavender where they were involved in planting Lavender shrubs in the Lavender Hills neighbourhood. Artwork and Urban Farm for the production of lavender products. Lavender aims to have the Lavender Hills project act as a pilot project, with the hope of replicating this into other struggling communities in the vicinity with similar problems. • These products are sold in stores and money goes back to running the project, planting more gardens and employing more people. Commencing January 2014, Kenya, Uganda and Rwanda has adopted a single joint visa deal to facilitate the free movement between these countries for tourists and citizens alike. This arrangement makes these three countries borderless and presents an opportunity to grow tourist numbers as they jointly offer very diversified tourism products. This visa is cost effective and will boost tourism in the region. It is hoped that other East African countries will join this initiative. As of January 2014, the Zambian Government has implemented 16% VAT on all services. We are hoping that this will only affect new bookings as of today. When we have more news on this, we will advise agents. We have had a very busy year and are looking forward to some time off over Christmas. I trust that you too will have a good break and enjoy great times with family and friends over the festive season!